Welcome to Christmas Cookies Week. This fun event is being hosted by Ellen of Family Around the Table. Ellen invited us to share our favorite Christmas Cookies all week long. Ellen also worked with Nielsen-Massey who is sponsoring this event and arranged for the participants to each receive a sample of their extracts. I chose peppermint because peppermint screams Christmas to me. All opinions written in this blog are entirely my own and I received no monetary compensation for this post. Nielsen-Massey Fine Vanillas & Flavors is giving one winner a set of their pure flavors: 2-oz each of Orange, Lemon, Peppermint, Almond, Chocolate, Coffee, Rose Water, and Orange Blossom Water. You can enter to win this wonderful prize package in the rafflecopter that you find at the bottom of this post. On this first day of this event we are also celebrating #InternationalCookies hosted by Caroline of Caroline's Cooking. Caroline was kind enough to schedule her party in conjunction with Christmas Cookies Week so that we are not overloaded during this busy time of year. Thank you Caroline! 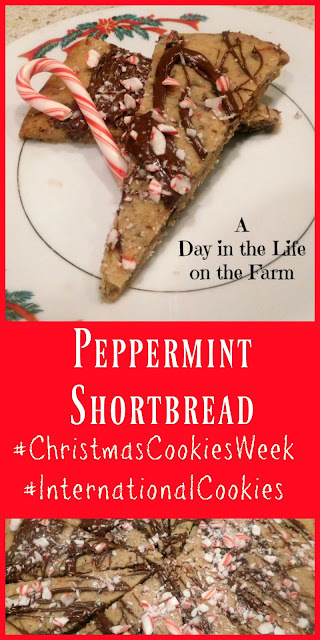 I decided to make Peppermint Shortbread Cookies for today, combining both events. Shortbread originated in Scotland and is one of my very favorite cookies. The addition of peppermint and garnish of candy cane crumbles makes them perfect for Christmas. I found this easy recipe on the Land O Lakes butter website. 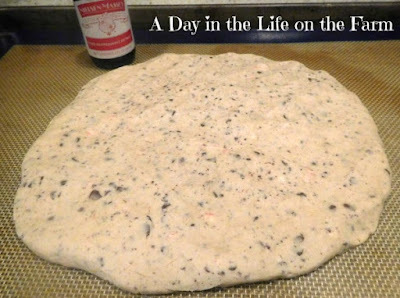 One of the things that attracted me to this recipe was that it made on 8" round that I then scored to make a dozen cookies. When you are making a weeks worth of cookies, you look for recipes that are small or can be halved, otherwise you end up with more cookies than you could possibly use. 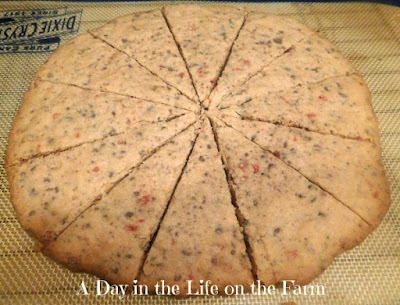 Of course, if you aren't making cookies every day for a week, this recipe is easily doubled or tripled. With chocolate and candy canes both baked into and then used as a topping, these cookies are festive and perfect for kids and kids at heart. Great as an addition to a cookie tray or as part of a dessert buffet but also fancy enough to be served as dessert with coffee after an elegant dinner party. These cookies are sure to become a yearly tradition. Place butter in bowl of stand mixer, fitted with the paddle attachment. Beat at medium speed until creamy, 30 seconds or so. Turn speed to low and add the flour and powdered sugar, beating until well combined. Increase speed and add vanilla and peppermint until well mixed. Reduce to low and stir in the chocolate chips and candy cane pieces. Place the dough onto a baking sheet lined with parchment or a silicone mat. 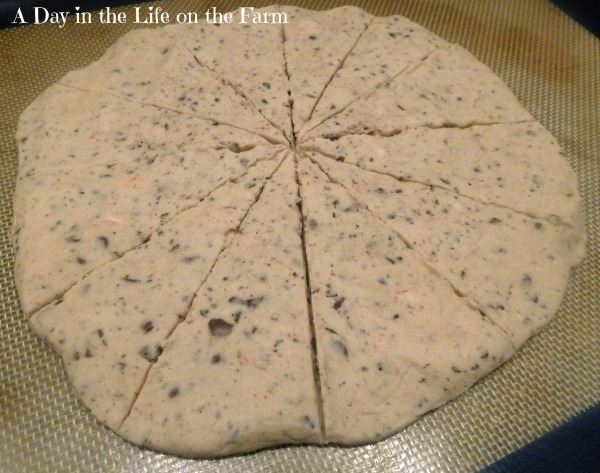 Pat the dough into an 8" round. Score with a knife into 12 equal pieces and bake in a preheated 350* oven for about 15 minutes, until golden brown on the edges. Remove from oven and let cool on the pan for 1 minute. Cut through each score line and then move the silicone or parchment containing the cookie round to a cooling rack to cool completely. Place the 1/4 c. chocolate chips and oil into a small bow and microwave on high for about 15 seconds, stir and cook in 5 second increments, stirring after each until smooth and glossy. 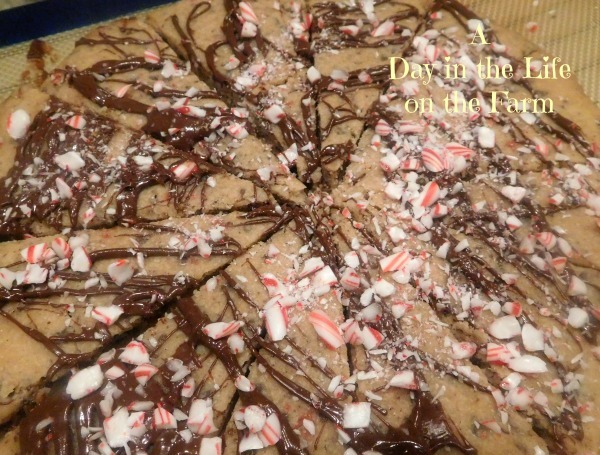 Drizzle over the cookie circle and then sprinkle with the candy cane pieces. What a festive treat! You can't go wrong with chocolate and peppermint! These look so incredibly festive! Ooh, I love the addition of chocolate chips, candy canes, and peppermint. 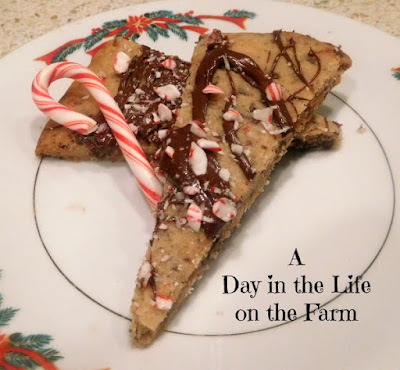 Such a perfect cookie for the holiday season! These look lovely and delicious. I would love a wedge. I haven't' gotten into the holiday baking but have my mind set on some coconut-chocolate cookies (which are my recent favorite). I like the shape! So fun! That's for sure Karen and they are quick and easy enough to whip up another batch when the first disappears in the blink of an eye. I do simply adore shortbread...I've never tried peppermint before though! Interesting...and probably something I should try! You absolutely should try it Colleen. They are luscious. Chocolate and peppermint are both favorites at our house and these look really delicious. They will surely be added to my holiday baking list! I'm sure you will enjoy them Mary.